Purchase a license online and activate ArraySync instantly. Use ArraySync (server) in demo mode, or activate by purchasing a serial above. Activate ArraySync server without an internet connection using your smartphone or other mobile device. You may also download previous versions from the archive. The current build of ArraySync may not self-activate under Mac OS X Lion due to a fundamental change in the operating system. Click here for a temporary workaround. This will be fixed in the next update. Sorry for the inconvenience! The quick and easy way to impress. 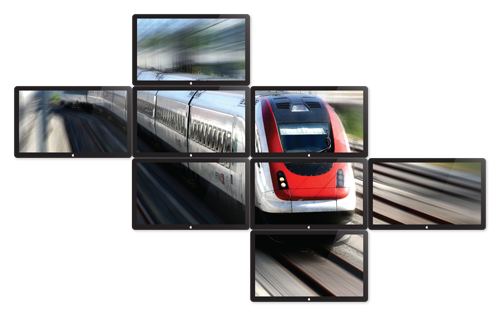 Create dazzling multi-screen presentations with ArraySync, the network QuickTime synchronizer from The National Software Laboratory. Play QuickTime content across multiple displays attached to one computer or over a local area network as if it were coming from a single video source. ArraySync is the ideal solution for event designers, trade shows, exhibitions and conferences. Whether you have Macs, PCs or both, ArraySync plays nice with all your hardware. Use a Mac as a server controlling PC clients, or a PC server controlling Mac clients, or mix and match Macs and PCs in any combination you can imagine. ArraySync's underlying protocol is platform independent. * Video spanning mode is not available on Windows for technical reasons.